Jessie came from a musical family; her great-grandfather was a fiddle player her grandfather, Sid Hemphill, was a blind fiddle player and bandleader. The Hemphill’s were multi-instrumentalists with her grandfather also playing panpipes, drums, guitar, piano, banjo, and fife. Her aunt Rosa Lee was also a well known performer who recorded several albums. Rosa Lee, like her sisters Sidney Lee and Virgie Lee Hemphill (Jessie Mae’s mother) played stringed instruments, as well as drums and tambourine. According to She began playing guitar at age 7, and later played bass drum her grandfather’s fife and drum band. She lived in Memphis for 20 years, playing on Beale St. when she wasn’t working various odd jobs. By the time she decided to return home to the country in the mid ‘70s, Jessie Mae focused mainly on her guitar playing. Hemphill’s guitar style is often described as idiosyncratic. The stomping guitar parts act as a rhythmic echo to the words and percussion. Although folklorist Alan Lomax had recorded several of the Hemphill family members in the ‘50s, in addition to Mississippi Fred McDowell, most of the musicians of this region would remain unnoticed for years to come. Jessie Mae’s solo recording career began in the early ‘80s with several singles on the High Water label. In 1981 she released her first album, She-Wolf, on the French label Vogue. Unfortunately the album was only released in Europe and the Vogue label did not have sufficient resources for wide-scale promotion. The album gained critical acclaim among Blues enthusiasts, but failed to reach a broader audience. Nevertheless, Hemphill toured Europe on several occasions playing at large halls and festivals. In 1986 she toured France and recorded tracks for the Mississippi Blues Festival 1986 album on the French Black and Blue label, which achieved some recognition in the US. 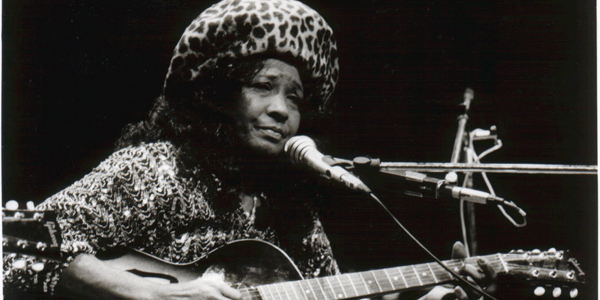 Hemphill won the WC Handy Award for Best Traditional Female Blues Artist in both 1987/88, even though she had yet to release an album in the states. In 1991 she released her second album, first in the US, entitled Feelin’ Good on High Water. The album won the WC Handy Award for Best Acoustic Album that year. Coming off the success of Feelin’ Good, her career looked bright for the ‘90s. In 1993 she suffered a stroke that paralyzed her left side, leaving her unable to play guitar. Jessie Mae Hemphill passed away July, 22nd 2007 in Memphis TN.